Do you know your A B Cs? A - is for post 1972 Corning Ware, when they straightened the sides and widened the handles (the lids have larger knobs too) Later, the stamp would be embossed under the handle. C- is for the Classic Elegance line (mid 80s) which is designed similar to French White, but without the vertical ribbing. These are printed with designs like Mille Fleur (below left), Jardin, Deco (below right) and Sticks. CW- is for the French White II line (mid 90s) which is designed similar to French White, but with flared sides. The pieces themselves are unmarked, however their lids give away their series designation. DC - is for the Designer Casseroles from the late 70's which look similar to the French White line, minus the vertical ribbing. The 4 known designs are April, Blue Heather, Indian Summer and Meadow. DO - is for the Cookmates flat ground bottom Dutch Oven made prior to 1972, when the KA prefix was added. Thus these have P series lugs. Usually found in white, these were sold with the "Counter that Cooks". F - is for the French White line that appeared in 1978 and includes French White, French Bleu, Classic Black and French Bisque. G - is for the original series letter given to the "Everyday Gourmet" line "French White". This letter designation was changed to the "F" series for French White shortly after the release. JCP - is for the JC Penney exclusive khaki colored candlewicking design from around 1970. Only known pieces at this time are 1 quart (JCP-1B) and 2 1/2 cup Petite pan (JCP-43B). No further information is available at this time. K - is for Cookmates.... See KA, below. L - is for the flared rimmed Casual Elegance Line from the mid 90s with the embossed decorations on the flared rims. (ie. White Flora, Calypso & Vineyard) These also have strange looking handles on their lids. M - is for Microwave cookware. Such as the M-68 dual spout sauce pot. (Which I believe may have been the replacement for the original "Saucemaker" as well) It is unclear how many different pieces exist with only an M designation, as they were further broken down into MCs, MRs, and MWs depending on the intended function. MR - is for specialty Microwave Racks... I know of only the MR-1, MR-2 & MR-3. MW - is for Microwave Browners. These are specially designed pieces with tin oxide applied to the bottom. These pieces are preheated in the microwave so the tin oxide can heat up and brown your food while you finish nuking it. While pieces, like griddles and platters had their own designations (MW-1, MW-2), some pieces, like skillets, were prefixed with MW. For instance, an A-10 "10 inch skillet", that had the Tin Oxide added to the bottom to convert it into a browner became... MW-A-10. P - is for the Original Corningware that ran from the 1962 through 1971; though some pieces stayed P- models all the way through 1999 like the Menuettes, Petites & Grab-its. PP - is for the Cookmates Petite Pans with the flat ground bottoms. Dates of manufacture unknown as the petite pans did not change after 1972, but much later in the 90s when the tops of the lugs were flattened. S - is for the round saucepans (shaped like Visions) that are also known as Corning "Rangetop" (not Rangetoppers) from the mid to late 80's with pyroceram handles (instead of the detachable one) This change was made after Visions hit the market and the Visions style built in handle met with public approval. All of these are marked in liters instead of quarts. Though the name of the line is similar the S series does not have an aluminum clad bottom. Known pieces are S-81, S-1.5, S-2.5 saucepans and the S-10 skillet. SM - is for Cookmates Saucemakers with flat ground bottoms. These were made prior to 1972 when the KA prefix was added to the Cookmate line. I do not know if they were manufactured after 1972. SP - is for Cookmates Saucepans with flat ground bottoms made prior to 1972 when the KA prefix was added, thus they have small P series lugs. TP - is for Cookmates Teapot. Though usually prefixed with a K.
TK - is for Cookmates Tea Kettle with the flat ground bottom. U - if for the mystery that just recently surfaced on the Corningware Facebook group... No idea, but they are out there. I saw a U-5 on eBay. The U appears to stand for "Unclad" rangetopper (meaning they contain no aluminum. Pieces range from the U-1-B, U-1 1/2-B, U-2 1/2-B and U-5-B. All of which look exactly like the N-series rangetoppers, minus the aluminum cladding on the bottom. To date, neither the 8 or 10 inch skillets have appeared in the U-series. The U-1 1/2-B was used as an employee Christmas piece in 1983. W - is for the infamous Wheat pattern on the P series Corningware pieces. Intended as the original design for Corningware, since market research test pieces had been well received, haste to bring the product to marked forced the Cornflower design to be used instead. It appears to have been revisited later; being manufactured between 1962 and 1970. Thought to be an exclusive of the Bon Marche in Seattle, WA. It may have been sold by other "discounter" stores such as Fred Meyer (also in the Pacific NW). XYZ - are for the ones that you eXamine and ask yourself whY you cannot find a mark on them. They are more than likely Generation Zed. French White II falls into this category, as there are no actual model numbers on the modified French White design released in the late 90's just as Corning Consumer Products was sold to Borden, Inc. which later reorganized into World Kitchen, LLC and began peddling stoneware facsimiles of the original French White. Some of the smaller original style French White ramekins fall into this category as well..... The 4 oz and 7oz sizes are an excellent example. I didn't know there were so many. This is going to make a great reference. They are interesting and useful little pieces. Why they were labeled Visions (the name for which clearly came from the ability to see your cooking progress) when they are solid white and not see-through is a headscratcher for me! Well, whaddya know. I had no idea they did that to the Casserettes. I looked at it and automatically assumed it was a P-14-B from the Grab-It line. I wonder if these were coming out of the Martinsville plant. They were the ones who were manufacturing Visions in the United States. And I know there are Amber and Cranberry Casserettes that are marked as V-14. Hmmmmmmm. Soooo much information, thank you! Hope you have a wonderful Thanksgiving. Shane, what a wonderfully informative post. Thank you so much for this. I was always confused with the different nomenclature Corning used on the bottom of their handles/cookware. For the longest time, I was wondering about one of my pieces that had been marked B. And thank you for the great tip on where to find handles. I hadn't ever seen them in thrift shops, probably because I didn't know where to look. What do you know, after reading your post, I looked in the utensil/handle bin and found one. Great post as always Shane. Quick question though about the markings in the P series. 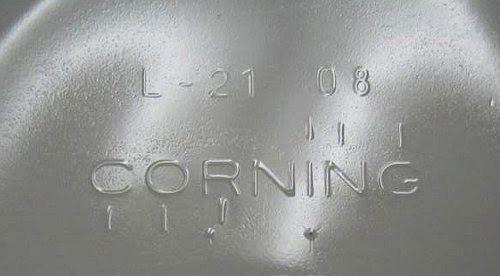 My closest guess is that Corning began the Cornflower series with the embossed markings from about 1958 through early '59. My set, which is stamped "Pyroceram" in blue ink on the bottom, was purchased for me prior to my wedding in June 1959. So I assume that stamp was used until sometime in 1960. Pieces I added to my "Royal Family" set (10 in skillet with 1qt,1 1/2 & 1 3/4 qt saucepans) included a 2 1/2 saucepan around 1961. That was a Trefoil & had blue ink, but no model number, no mention of Pyroceram either. Now, my younger sister received her Corning Ware set around 1967. By that time, the stamp on the bottom was black, with the starburst, but there was no mention of microwave use. There is also a stamp on my butterscotch buffet dish with both the starburst, and cornflower designs. I've seen different variations of these both with and without the mention of microwave use. I'm guessing those were in use from about 1968-71. Just my personal recollection. I thought someone might be able to nail down some dates. Thanks so much for this helpful information! Interestingly, I have had some of my Corningware since 1969, and I've never chipped or broken any of it! I still buy an occasional piece from ebay. I think this pattern series may have been for Australia and South Africa. I have square casseroles "L'Echalote" "LaMarjoran" "LaRosmarin" sizes .7l 1.5l 2l 3l and a huge really heavy one, plus a large flatter frypan shape with detached handle. Also a garland of flower shape 3L. bought in New Zealand. They are over 30 years old and were transported from South Africa to New Zealand in my air luggage. My relatives were quite sure that it was money thrown away as they would break in transit, however only two of the four set of .7l were accidentally dropped a couple of years ago. They have been used extensively. Even though I have many other pots and pans, not stick, pressure cooker etc. only one small stainless steel copper sandwich bottom that has had caramelized sugar and worse burnt on it, has kept up with the corning ware, fantastic stuff. Anyway, thanks for posting all this info - it's an excellent reference source!!! I have a question about storing Corning Ware! I saw a tutorial somewhere showing that you should NOT stack saucepans (which don't stack straight anyhow) because there is greater chance of chipping. I have limited space for storage, and my question is this: would be be all right to stack casserole dishes of the same width -- for instance a 1 L dish within a 2.5-Liter dish? I do already stack the really small ones. You should be fine stacking them together like that..... The only ones that really have a problem are the Rangetoppers and Rangetop pieces (with the pyroceram handles).. They should not be stacked within one another like that. But regular square Corning Ware should be fine. I use my 7" square 1 quart/1 liter A-pans for freezer prep with the rubberized plastic lids, which are slightly indented, makes them great for stacking. I store them in my cabinet with the lids on. It serves to cushion them and it also reduces the clattering/noise. The top one on the pile gets the inverted glass lid. on a campaign to rid my kitchen of all dishes, mugs, glasses and cookware that contains lead. tell me will be appreciated. cornflower pie plate. The flower is on the inside where it will directly touch the good. What more can you tell me about the danger of lead abd corning ware? Gigi, your old corning ware pieces should still be lead-free. I found this entry in a customer discussion on Amazon entitled CorningWare: The Life, Death and Resurrection of a Kitchen Icon. Neither Pyroceram nor Calexium contain lead because the material needs to be radio-transparent to be microwave-safe and, in its earliest application as a guided missile nosecone, it needed to be radar-transparent. There might be some confusion with a few short-lived Corelle patterns that had metallic trim believed to contain lead. thank you! I too am concerned about the lead, after i purchased several cornflower corningware baking dishes from Replacements.com. On the issued receipt, they added the Prop 65 warning stating that "Use of this cookware will expose me to lead, a known carcinogen in the State of CA" (where I live). they said I can return the items for a refund if I choose, and that I can request a list of their cookware that also has this warning. Now I have to call the company, Replacements.com, to see if any staff member knows why my corningware came with this warning. I'm ok if the outer cornflower design has lead paint, but i would not want to bake anything in the dish, if the pyroceram has lead. Many thanks for this very useful information. However it doesn't show the stamp on the bottom of my dish and I wonder if you can help. I have a French White F-2-B casserole dish. It looks like the genuine pyroceram as the fluting is more delicate and the bottom is smooth all over. 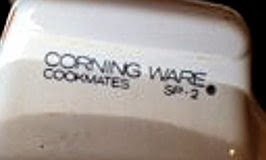 However it is stamped with 'Corning' on the bottom, not 'Corning Ware'. It is also stamped with 'French White F-2-B 2.8 liter'. The registered mark is shown beside both 'Corning' and 'French White'. There is no mention of where it was made. Is this genuine pyroceram Corning Ware or is it stoneware? Your piece is still Pyroceram. World Kitchen does not use the F-series numbers on any of their French White Stoneware. I am unsure why the country of origin is missing, though it may be a piece that was manufactured within the 1.5 year time span when Borden owned the Consumer Products Division before their Bankruptcy and subsequent reorganization into World Kitchen. Borden was still producing Pyroceram up until the very end. says Stoneware and China. I'm shopping for a used Pyroceram 4Q/4L. Seeing lots of them that have the F series in various back stamps. Are these Pyroceram? Don't want to be fooled again! Yes.. any French White piece with an F-Series number (or G-Series number) is Pyroceram. Pyroceram French White was produced from 1977-2000, so there are several different marks used during those years... The mark style does not matter, it's whether or not the piece has a real model number that is important. Three weeks ago I found two U-Series pots in Spice of Life pattern at a local thrift shop here in Central Florida. I've never seen these before. U-1 1/2-B and U-2 1/2-B. Why the B designation is a mystery, at least to me. These have the handles as part of the pot. The B designation in the model number indicates "Bowl/Bottom dish". 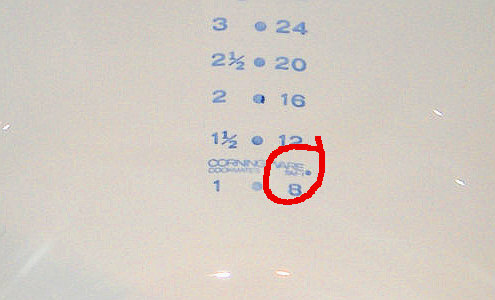 The coorisponding lid model numbers usually end in a C for "Cover". I should have realized. lol! Thanks! Three weeks ago I found two of the U-Series in the Spice of Life pattern here at a thrift shop in Central Florida. U-1 1/2-B and U-2 1/3 B. These were saucepans with the handle as part of the pan. I've never seen the U series before this. Your blog is wonderful! I've learned so much here. Thank you for your time and effort! Congratulations on finding a U-series piece with a pattern on it! So far, I have only seen plain white pieces. I have come to the conclusion that these pieces are Rangetoppers that do not have the aluminum added, so they can be used in the microwave.... Thus the U, for Unclad. Shane, I'd like to send you a picture of my U-Series Spice of Life rangetoppers. How do I do it? A25 is a mold number. 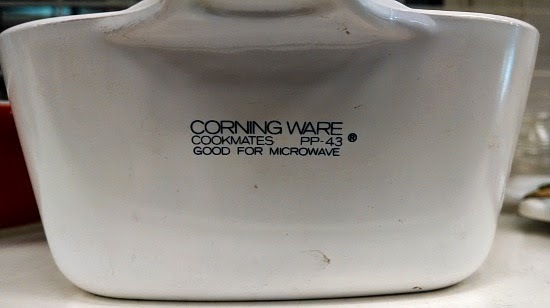 1st generation Corning Ware has a lot of different numbers embossed on the bottom. mostly A# or B#, but there are a few C#s as well. Still 1st generation. Actual model #s such as P-#, A-#, W-# did not exist until the end of 1961.
on the buffet server with the black knob.. is the knob oven proof or have to use foil or something in the oven and then put the lid on it? The black knobs on thr buffet servers lids are made of Bakelite... Bakelite begins to blister at 350F degrees. Not sure if foil will help. Have a white round casserole with white cover and black handle. B-21/2-B Sides of casserole are flat. Any idea what I have? None of these look like the stamp on the bottom of the one I have. Wanting to sale several pieces and needing to know value.the stamp is blue CORNING WARE with the symbol inbetween words and what looks like two circles or a circle and a c or maybe a fancy d not sure under each word it has2 1/2 under one and it. Under other looks double stamped. Sounds like you have a piece from the pre-model number era. 1958/59 had embossed information on the bottom, but no P-Series model number. Likewise, 1960/61 had blurry blue ink information printed on the bottom. Actual model numbers did not begin showing up until really late in 1961 with the release of the Electromatic Percolator and Electromatic skillet. Most of the regular cookware started receiving model numbers in early 1962. Check out this blog post on 2nd generation piece... I think it has what you are looking for. Shane, love love love this!!! Have learned so much from you and now am a Corning Ware nut, too! Quick question: I have a 10" blue cornflower with the blurry blue ink on the bottom that says Corning Ware 10 in. APD. What is APD? Should I hold on to this? Didn't know if it was something special. Thank you!! Regarding Corning Ware Pyroceram mold numbers, were the A mold numbers created first, then the B mold numbers, and lastly the C mold numbers? I have a FP 8.5 corning skillet. The handle looks like plastic. Is it oven safe? Im thinking no, but want to hear what you all say. Sound like you have the Cookmates version of the P-908 Gourmet Skillet with the bolted handle. These are oven safe, to a point. They are made of Bakelite, which starts to blister at about 350 degrees... I usually don't use them in an oven over 325,myself; just to be safe. I found an Amama Radarware plain white browning skillet marked 1180 MA. There is no oxide coating on the bottom. Does this mean it's inside the pyroceram? Sounds like you found a factory mistake. (Especially since the Amana Colonial House house is missing - Amana's Trademark) There have been a few of these type items popping up over the last couple of months. They are usually later model items though... Like the MW-85 handled tray. The gray tin oxide coating is always applied to the bottoms underside. Sometimes they coated the tin oxide layer with an black enamel layer as protection from scratching. But this seems to be more prevalent on later model items, and not the original square skillet dishes. I have had a P10b 10 in skillet for awhile and just recently found a small knob lid to fit. However,it is marked A-Z with the only other lettering being the Pyrex trademark. I am wondering because it doesn't show up on your list. Thanks in advance for taking the time to answer! I have a Corning Ware petite casserole dish. it is marked on the bottom with: Corning Ware P43-B 700mL 27. i have tried to find the name of the pattern but no luck. The pattern is of a man and woman seated at a small round bistro table in front of a window. the man has a cup of "steaming" coffee. he has a white shirt with black pants. she is wearing an orange dress. Do you know of this pattern? thanks for your reply, i have been searching many websites but no luck. if it is an employee item how many of the items would have been made? Would this have been a test pattern to see if it would sell? Is there a value for this? Thanks again for answering my question, much appreciated. Hello. I have a Pyrex P-7-C lid for a Corningware dish, and I was wondering what is going on with it. As I was washing it (hand wash) I noticed the glass is unevenly frosted and rough like the glass shades on ceiling fans, and it has splotches of a rainbow hue in the glass in places, also unevenly. It also has a wavy groove pattern on one half of the lid but not the other. Was wondering if it might have been colored at one point or is there something unique about it, or maybe it was damaged? I also have another lid that has a bunch of blobs within the glass itself, I guess they didn't have quality control back then? Thanks for this great list. I just purchased a blue Cornflower Dutch oven 4 quart with base number P34B and lid P12C which according to your list is a matching set. It is in perfect condition. I paid $30 which may be high but I am collecting the larger pieces now that are hard to find. I have a number of the smaller squares but these range greatly in codes & not all lids match. Corningware is so great to cook with - cleans up easily. I love it! my mother has a Corning NY USA coffee cup microwave safe coded 81 F6 that she was hoping to find a couple replacement cups for. It's a rather small cup (not a mug ) with a light blue ring at the top of the cup, and a light grey ring under that blue ring. A branch with berries on it is the pattern on the side of the cup..in light blue color similar and or the same as the top ring color. Not having any luck locating these. Any recommendations? thank you for offering some assistance. That sound like a Corelle cup, which is not made of Corning Ware Pyroceram... (though Corelle was made by Corning, Inc.. along with Pyrex) I don't collect Corelle, so I have no idea what the pattern name is. Sorry I cannot be of more help. Hi, Shane! I have some kind of Corningware dish that I'm pretty sure was my grandmother's; I've never looked on the bottom of it (but I will tonight). I was in a thrift store today and saw several dishes in the same pattern and got really excited. Now I'm wondering if they're just stoneware that's just a few years old? A few of them had no markings on the bottom at all. One says Corning Ware P-41 Petite Pan, and Made in USA. It has the starburst logo above. The other has the same logo and USA, but says P-4-B, 1 1/2qt. Should I snag them up? What about the ones with no markings? I'd like to have them all, as I had no idea what good dishes they were until I was reading up online today. I'd be happier buying them if I knew they weren't just stoneware. Any help would be appreciated! Thanks! The glass blower mark (Little Joe) was commandeered from McBeth Evans when they merged with Corning.. it is usually found on older opalware items that were first produced for the military. Thanks Shane! Another great piece of information! The lid is the same size as the on used for the 8 1/2 inch skillet as well.. Not sure of the exact measurements though. Good to know. Thanks, Shane! I have some dishes marked Corning -made in USA, with a glass blower pic. Just a different number on every piece. I can see light through the white glass if I Hold it up . Guessing they aren’t the durable material? They have a little green leaf design. What are these? Any info? Not sure how to post a pic. I have a simple question. What is the difference, if there is one, between the Grab It Bowls and the Grab a Meal pieces? I have not seen anything that is labeled Grab A Meal, but I noted that some of your Christmas patterns use this term. It's just a matter of size. The P-240-B Grab-a-Meal bowl is 24 oz, instead of 15 oz like the P-150-B Grab-it bowl. I have a question about my Spice O' Life 6 Cup Teapot. On both sides of the teapot at the lower right outside if the pattern is the # 24 with a wavy line underneath the # 24 laser etched into the teapot. What does it mean or stand for or refer to? Thank you! SOL and Wildflower often have these small numberd on the lower right portion of the pattern.... They are the silk screen numbers since all the different sized pieces in the line have slightly different patterns.